Bretagne in blue, composing 80% of the former duchy and province of Brittany. Loire-Atlantique, in red, contains Brittany's historical capital Nantes. Over 10000 people took to the streets of the ancient Breton capital of Naoned/Nantes last Saturday (20th September 2008) to demand the reunification of Brittany. The demonstrators - a large proportion of which were young people - were calling for the re-unification of Breizh/Brittany, in addition to increased rights for the Breton language and more legislative powers. Chanting slogans such as « Justice for the Bretons », « One solution : autonomy for Brittany » and « We want it, we'll have it - re-unification », the protesters showed the strength of feeling for re-unification that continues to grow (five years ago a similar demonstration attracted 5000 supporters) for this part of the French administrative region of Loire-Atlantique, which was cut off from the rest of the Breton nation in 1941. So what exact increased rights and legislative powers would this entail? Public funding for Breton in every school? 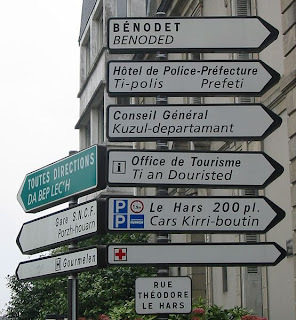 Ability to enact laws to create bilingual signs throughout the area, something like that?